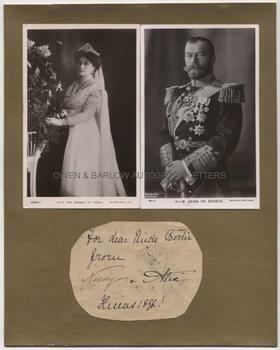 TSAR NICHOLAS II AND ALEXANDRA Signed Gift Inscription to the future Edward VII. Last Tsar and Emperor of Russia and his wife the Tsarina, both murdered at Ekaterinburg in 1918. 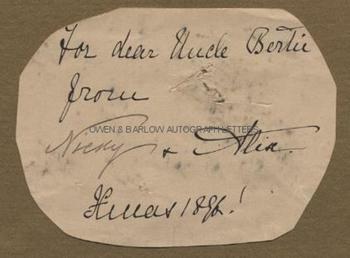 Paper piece signed by both Nicholas and Alexandra "For dear Uncle Bertie From Nicky and Alix, Xmas 1896". The inscription is in the hand of Alexandra but both Nicholas and Alexandra have signed their names in their own hand. The paper is presumably taken from the wrapping of their Christmas gift to Edward, Prince of Wales, sent to him in 1896. The irregular shaped paper piece measures approx 4 x 3 inches. At some time in the past it has been amateurishly laid down on gold card below two real PHOTOGRAPH post-cards of the Royal couple (the Tsar by Beagles and the Tsarina by Rotary). 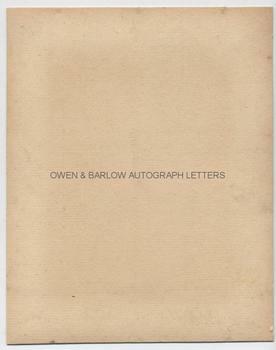 Both post-cards are circa 1910. Originally framed but now without frame. The paper has some old marking and small tear above Alexandra's name (not touching any part of the inscription or signatures). Nicholas married Alix of Hesse in November 1894, the same month that he had acceded to the Russian throne as Nicholas II. The coronation did not take place until 1896 - the year of this Christmas gift. Alix had taken the Russian name Alexandra Fedorovna to try and make her more acceptable to the Russian people. Both Nicholas II and Alexandra were related to many of the Royal Families of Europe and Edward, Prince of Wales, was Alix's Uncle. Edward apparently had formed a somewhat poor view of Nicholas when they had met, thinking him weak and ineffectual but Alix, increasingly lonely and isolated, did all she could to maintain contact and good relations with her European cousins. Following the Russian revolution, Nicholas II abdicated in 1917 and the Romonov family were held under house arrest. The family were deperate to go into exile in Britain but the suggestion was vetoed by George V, who thought this might lead to unrest at home. Both Nicholas and Alexandra were shot with their children in Ekaterinburg in the early hours of 17th July 1918. Documents signed by both Nicholas and Alexandra are exceptionally rare, as are personal communications between royal houses and the connection with the Prince of Wales, the future Edward VII is particularly pleasing.